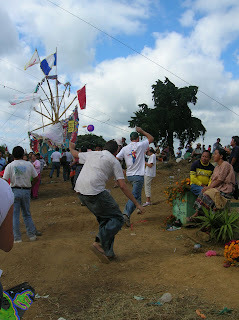 Poco a Poco - Peace Corps Guatemala: Kites! Kites decorate the electric wires in Cabricán like garlands down the stairs at Christmas. They hang there in deference to the dead. Instead of celebrating Halloween like we do in the states, Guatemalans celebrate All Saints Day and the Day of the Dead on the first and second of every November. Being biased to my own culture, I much prefer Halloween, dressing up in goofy costumes and scarfing down candy. I suppose that the original purpose of the holiday has been lost in our consumerist culture. In Guatemala they spend the days cooking huge amounts of food which they bring out to the graveyards to offer to the dead. Family members clean off, repaint and decorate their relative’s graves. Graveyards in Guatemala are not filled with the creepy grey tombstones of the states, but a bonanza of brightly colored tombs. These two days are also celebrated with huge kite flying festivals. Kids roam the streets with kites they’ve fashioned out of tissue paper. Most of them end up on the electric wires and I’ve heard quite a few stories of children getting electrocuted trying to get them down. 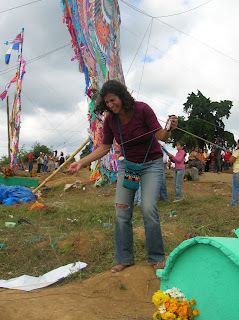 In towns like Sumpango and Santiago in the department of Chimaltenango the kite flying festivals have become quite famous and large tourist attractions. 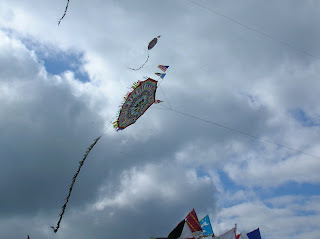 Kites created out of bamboo and tissue paper and so large it takes eight or ten people to carry them are set loose in the skies. It’s amazing to see them go up; especially considering we PCVs could not even get a normal sized kite off the ground. It’s amusing to see them fall; as the massive kite plummets toward the earth people set off screaming and running trying to get out of its way. I imagine you could be quite seriously injured if you were actually hit by one. 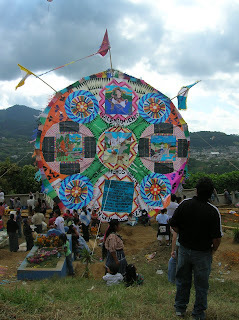 The towns also create even larger kites that actually do not fly but are dedicated to various social, environmental and other worthwhile causes. My favorite was one about global warming. The kite flying is not limited to these two days, and has only recently begun to taper off. The kites, however, will probably remain up in the wires until the elements bring them down.